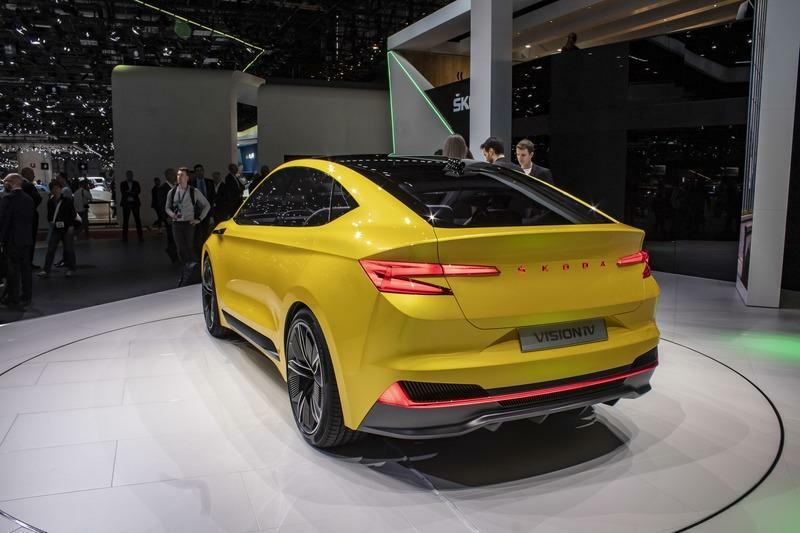 The Vision iV is a more aggressive evolution of Skoda’s recent concept cars wearing the "Vision" badge. While the Vision X was a rather mild mini SUV, the Vision iV is downright aggressive and, from many standpoints, quite unique. The front fascia is particularly striking. Not because it’s necessarily beautiful, but mostly because it introduced never-before-seen styling cues on a Skoda. The angled headlamps with three-piece LED units are extremely thin and angled toward the center, which makes the front end very aggressive. But the grille is also new. 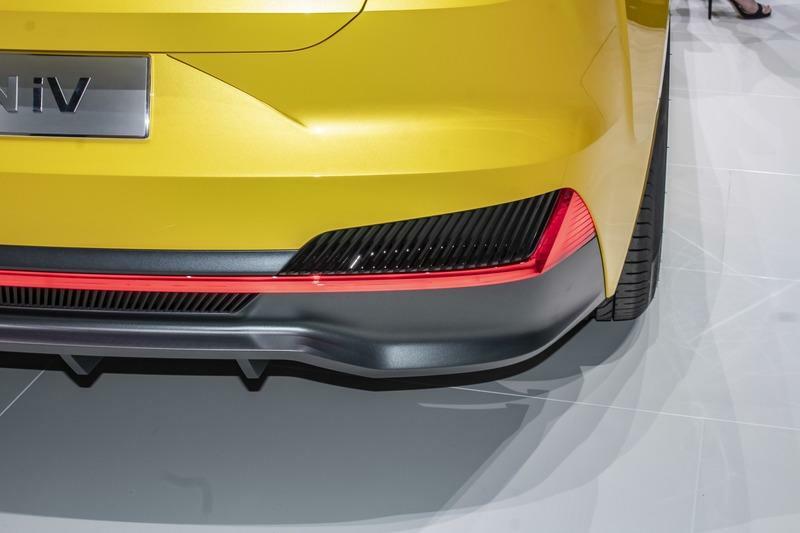 The more important bit here is the horizontal light strip that runs across the wide grille and connects to the Matrix LED stripes at the bottom of the headlamps. The bumper is equally aggressive thanks to the slanted black trim on the sides that simulate large vents. A thin horizontal vent placed right below the grille adds width, while the splitter at the bottom of the bumper suggests performance credentials. The profile is a bit more generic. 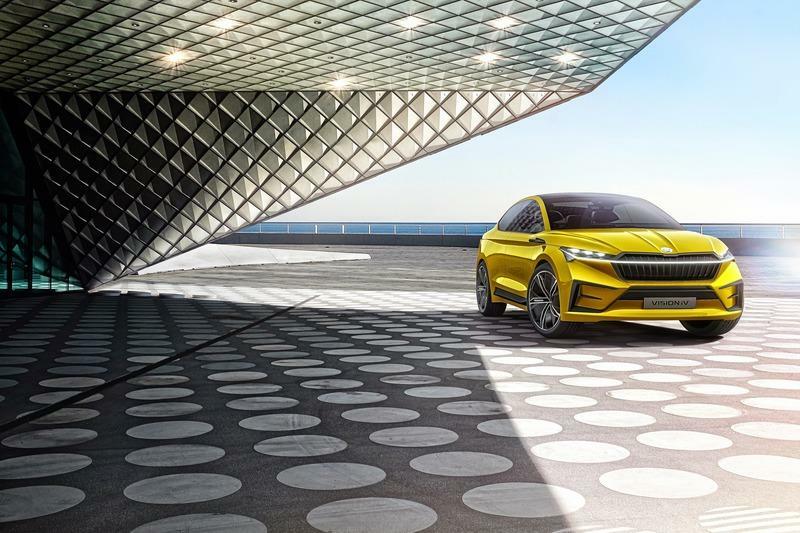 Granted, the coupe-style roof and the missing B-pillars make the Vision iV look somewhat exotic for a Skoda, but it’s a design we’ve already seen in plenty of production models, including the BMW X6 and the Porsche Cayenne Coupe. Skoda also adopted modern features that are rather common in concept cars, like touch-sensitive doors that don’t need handles, cameras instead of mirrors, and fancy wheels with a cross-five-spoke design. The rear end also reminds me of coupe-style SUVs. That’s probably because the roof descends all the way to the sharp spoiler, but also because Skoda carved the rear fascia in a fashion similar to what BMW and Mercedes-Benz did with the X6 and GLE Coupe. And no, I’m not saying that Skoda copied anything, this concept just reminds me of existing designs. At the same time, there are plenty of features that add uniqueness to the Vision iV, starting with the aggressively angled C-shaped taillights, the illuminated "Skoda" lettering on the tailgate, and the light bar that stretches the entire width of the lower bumper. The latter is a feature you don’t see very often, not even on concept vehicles. Size-wise, the Vision iV is 4.66 meters (183.4 inches) long, which places it right between the Karoq and Kodiaq SUVs. At 1.92 meters (75.6 inches) wide, it’s the widest vehicle Skoda built to date. It’s 44 mm (1.73 inches) wider than the Kodiaq, but it sits notably lower, hence the sporty stance. 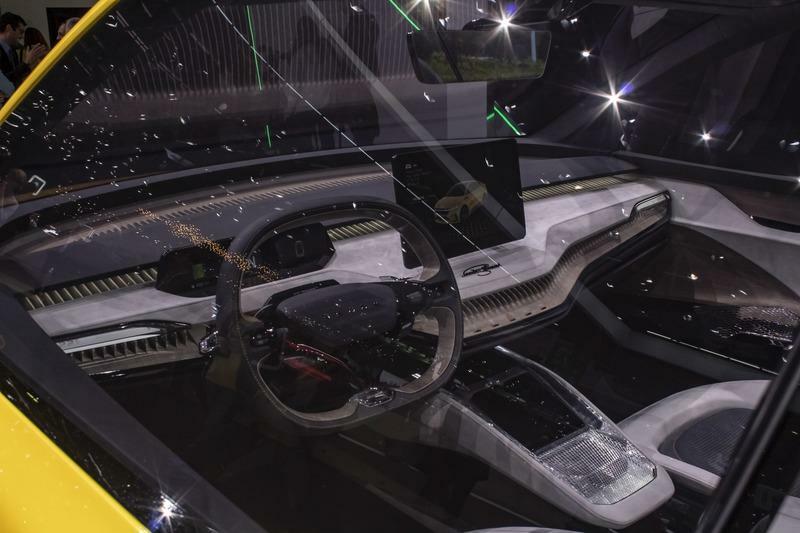 The Vision iV interior looks surprisingly cool. Skoda took an interesting approach to the multi-tier dashboard designs I keep seeing in modern cars by opting for three clearly defined levels. 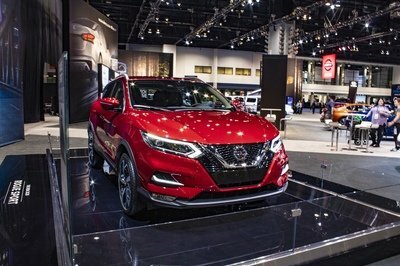 There’s an upper section that basically sits on a really wide A/C vents, a middle tier that holds the instrument cluster and infotainment display, and a lower section that includes a few buttons at the center and a big dent from the steering wheel toward the front passenger door. It looks as if it was designed by an architect and I like that. I also like the way the center section of the dash extends toward the center console but lacks a traditional stack. It’s not too wild, but it has a solid degree of out-of-the-box thinking. And it includes a ton of interesting details. First up, the digital instrument cluster is just a thin sheet placed in front of the steering wheel. There’s no plastic hood and no dial-shaped images. There’s a speedo in the center, a range meter to the left, and navigation to the right. Simple and clean, just how I like them. 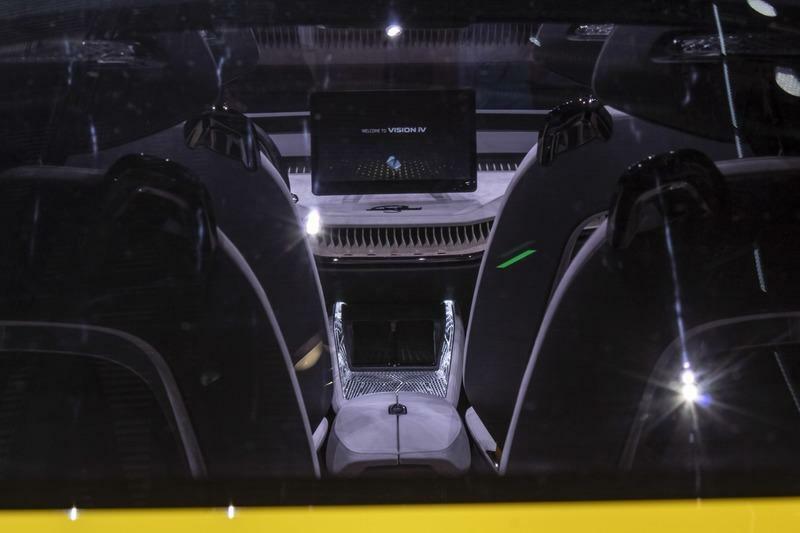 The massive infotainment display appears to be floating atop the center section of the dashboard and it looks rather imposing due to its size. I’m not sure it’s very practical in that position, but Skoda must have had some ergonomics in mind when it came up with this layout. 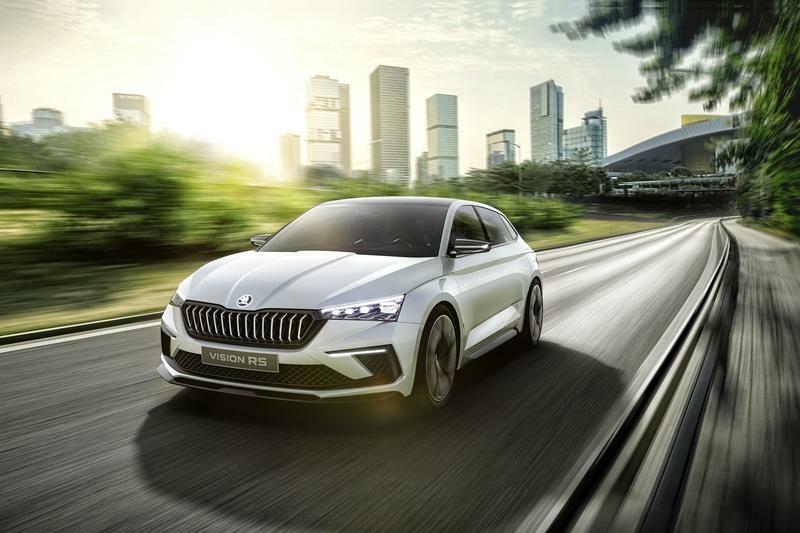 At the corners of the dash, where A/C vents usually are on traditional production dashboards, Skoda mounted thin displays that show ambient temperature, as well as small touchscreens that you can use to operate air conditioning. This way you’re not restricted to the center console as a passenger and you can select the amount of air you want to receive. The steering wheel is a brand-new take from Skoda and it signals a more premium approach for the future. 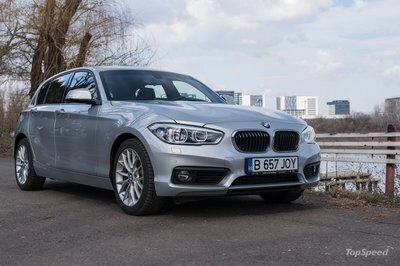 The Czech automaker ditches the round center section for a wide element that now includes "Skoda" lettering and only two spokes. The flat bottom and top wheel is wrapped in leather and fabric, stitched together with yellow thread. The same yellow detailing can be seen on the seating surfaces and the upper door panels. The foam-like surfaces with crystalline structures that you see on the dash and the door panels will become the norm in future Skoda models, as will the synthetic suede fabric. The decorative birch veneers won the lower dashboard won’t make it into production models, but hey, this is a Skoda at the end of the day and it has a specific purpose within the Volkswagen Group. The sporty seats are covered in Dinamica, a suede substitute that does not contain any animal-derived components. This fabric is already offered in many production cars, but it stands out in the Vision iV thanks to those perforations with yellow accents. This concept car is a fully connected vehicle. The infotainment system provides access to numerous online services and includes gesture control, voice command, and full integration for smartphones. The latter enables you to use the phone as a digital key, but it also enables the operating system to monitor your heart rate. In addition, it monitors the movement of the eyes to detect if your concentration is waning and alerts you to take a break. Skoda says the concept car is fitted with a premium sound system, but it doesn’t mention a specific brand. Skoda doesn’t offer an electric car just yet, but this didn’t stop the company from dropping a couple of electric motors in this concept vehicle. 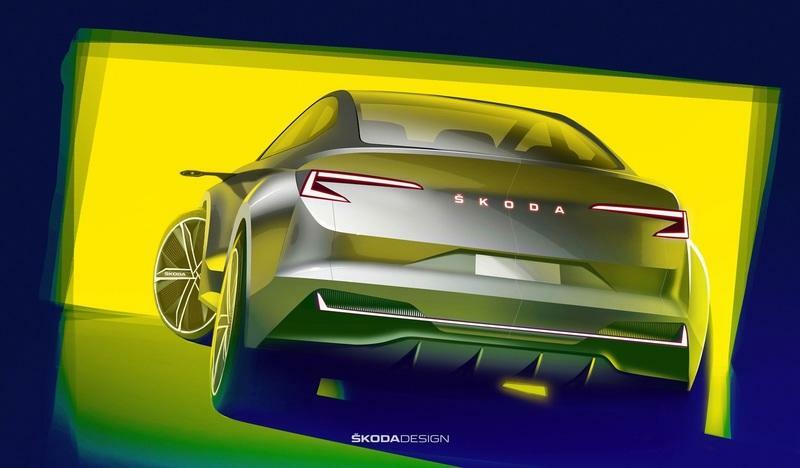 This is Skoda’s first passenger car based on Volkswagen Group’s MEB platform, so it hints at the firm’s first production EV. 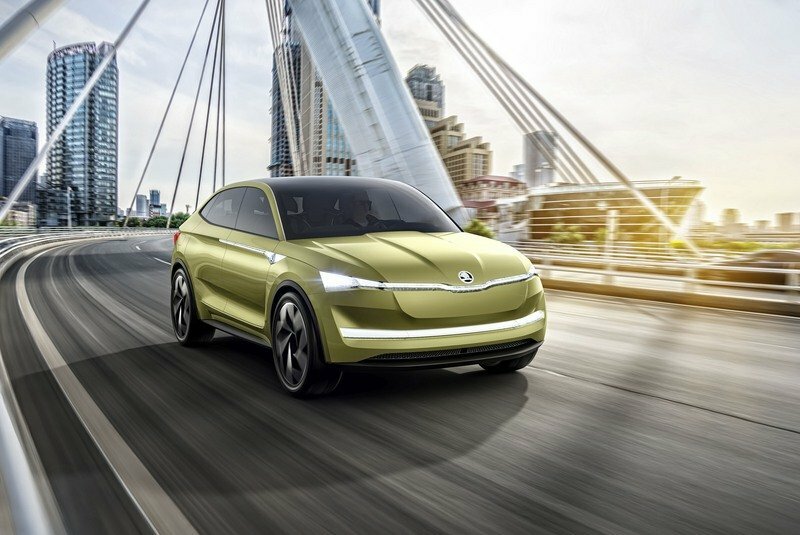 Skoda used two electric motors in the Vision iV, one at each axle, a setup that translates into all-wheel drive. Powered by a 83-kWh lithium-ion battery, the motors generate a total of 225 kW, which converts to 302 horsepower. That’s 60 horsepower more than Skoda’s most potent car yet, the Octavia vRS. 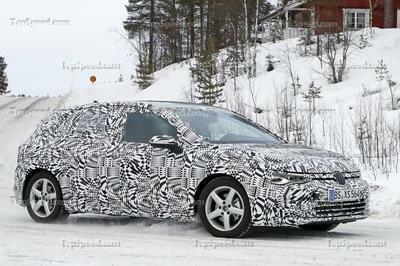 No word on torque, but the electric motors should surpass the Octavia vRS’ 245-pound-foot rating by a notable margin. Needless to say, the Vision iV should be pretty quick to 62 mph. A sub-six-second benchmark is totally doable given the horsepower rating and the instant torque provided by the electric motors. Its top speed could be slightly lower than the Octavia vRS’ 149 mph though. Skoda says this drivetrain layout returns a maximum range of 500 km in the WLTP cycle. Although Skoda won’t come to the U.S. anytime soon, this rating could be estimated to around 250 miles on EPA standards. If this rating is based on real world testing, the Vision iV is just as capable as most production EVs out there, including certain versions of the Tesla Model X. Skoda also developed a fast charging system that charges the battery to 80 percent of its capacity in just 30 minutes. 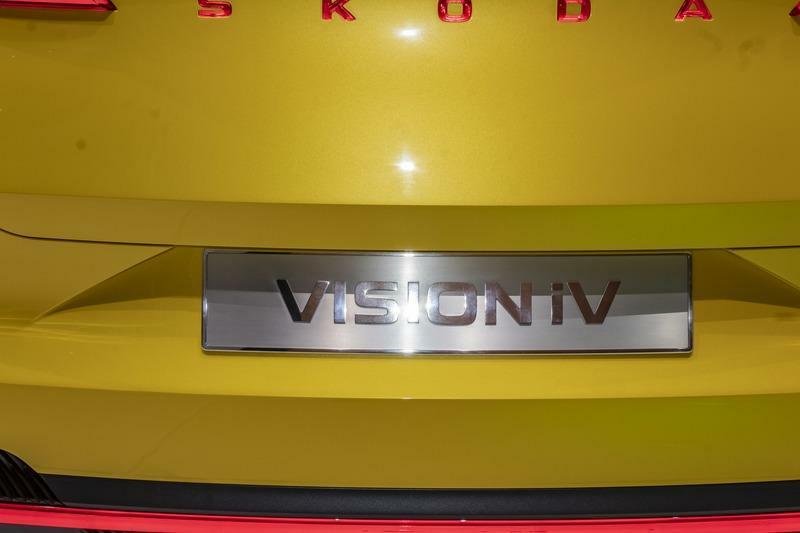 Also a premier for Skoda, the Vision iV is an autonomous vehicle in certain situations. Thanks to laser scanners, radar sensors, and camera, the vehicle can drive autonomously and park by itself. Unfortunately, Skoda didn’t release too many details about this system, most likely because it’s still a work in progress. The car’s advanced connectivity features also allow it to exchange information with other road users and vehicles, as well as with the infrastructure when possible. This further improves its autonomous capability, but it will take a few more years until such a system becomes fully functional in most markets. 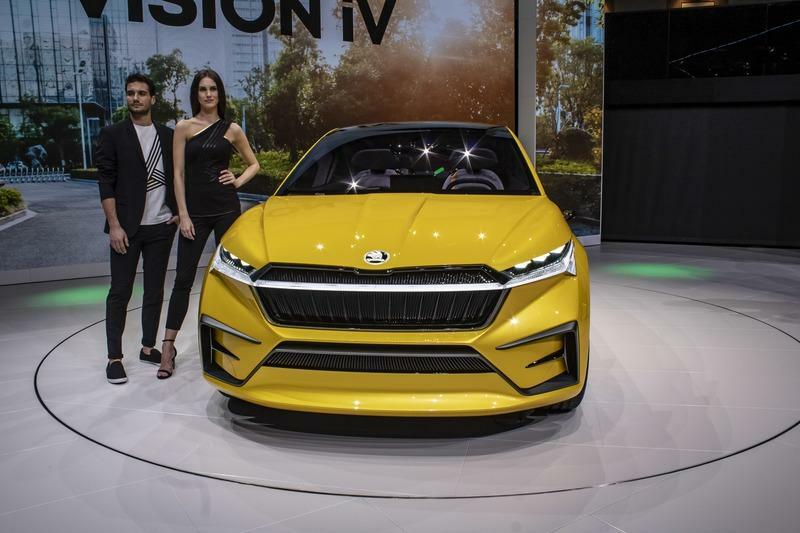 The Vision iV is an intriguingly cool design but the fact that it sports a "Skoda" badge makes it that much more special. 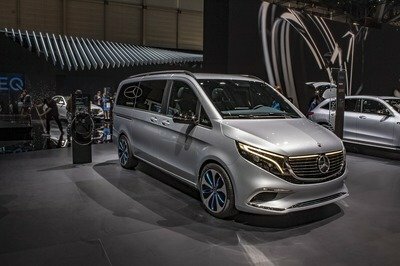 It looks like the Czech automaker is finally stepping out of its mundane bubble to embrace a more daring and exciting stance. Sure, the Vision iV is just a concept car, and we don’t know how much of it will go into production, but it definitely signals a new approach. 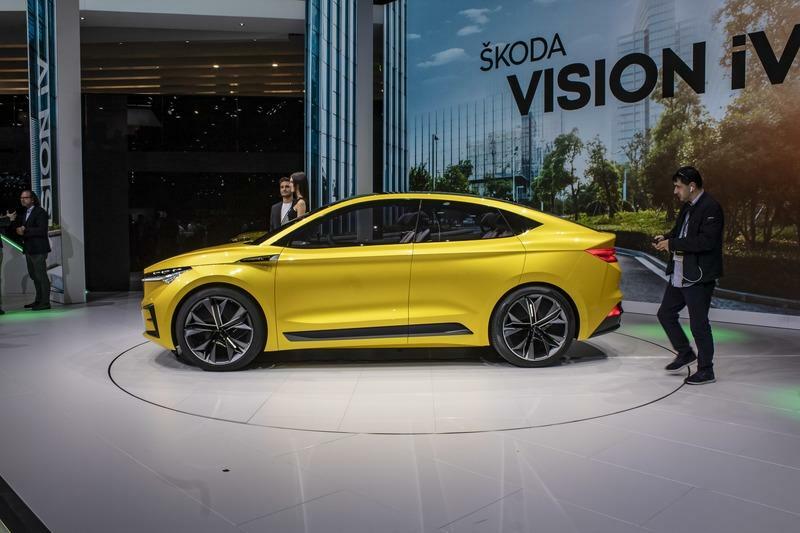 Skoda needs to evolve in this department in order to remain relevant, and the Vision iV feels like a good start. The good news is that the exterior design is complemented by an equally enticing interior that boasts modern features and tech. 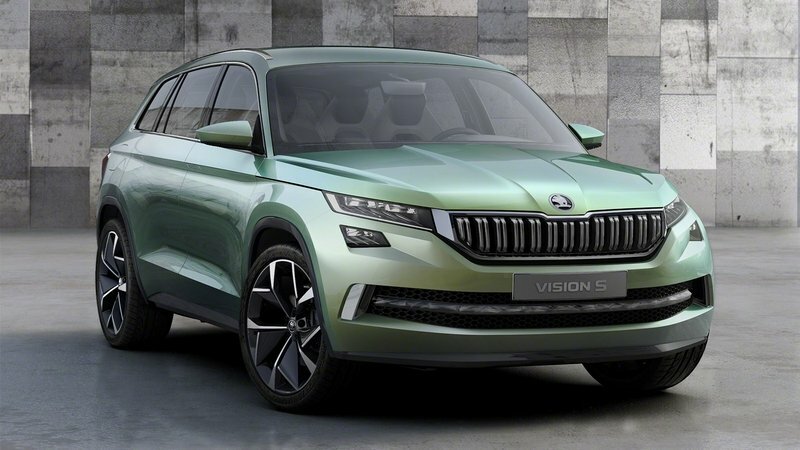 Again, not many of them will go in production in this form, but whatever comes off the production line next will be a notable departure from the current lineup of Skoda vehicles. 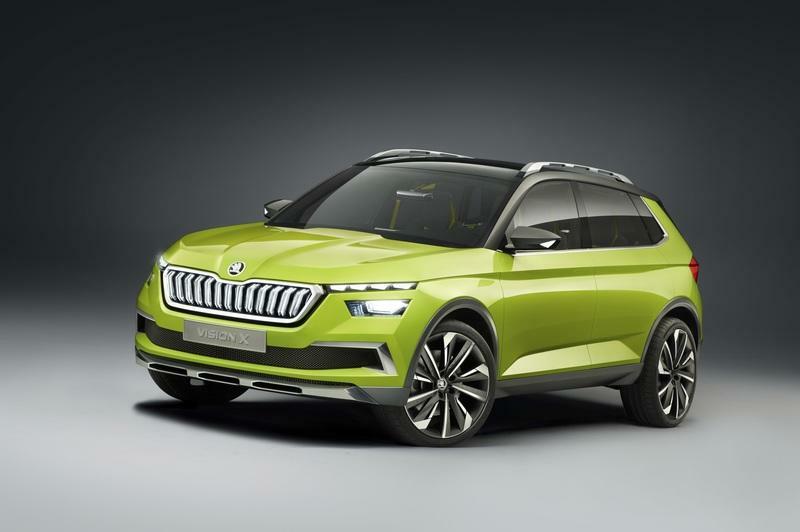 Finally, the fact that Skoda is finally stepping into EV territory is also great news. As an affordable brand, it should provide the market with electric vehicles that the average Joe can afford. Read our full review on the 2016 Skoda VisionS. Read our full review on the 2017 Skoda Vision E.
Read our full review on the 2018 Skoda Vision X. Read our full review on the 2018 Skoda Vision RS.